Let's just talk bluntly for a moment: Commercial Christmas trees are used primarily by businesses and municipalities, and they have a different mission to fulfill than private Christmas trees. Yes, both commercial Christmas trees and the tree in your home portray the spirit of Christmas. Yes, both trees can give people the warm fuzzies about the most wonderful time of the year. Yes, both the tree in your home and the tree at your business can evoke a sense of wonder and joy. But your commercial Christmas tree must accomplish so much more. It must also draw attention to your business or municipality. It must draw visitors to your city, or bring customers into your business. That's the true purpose of a commercial Christmas tree. And now there's a tree better suited to fulfill that role than any other in the history of Christmas. In its role as an attention-getter and customer-bringer, your commercial Christmas tree must capture and hold peoples' attention. It must dazzle and delight. It must evoke a sense of awe. And it doesn't hurt if your tree so impresses people that they are temporarily startled with the grandeur of the visual display. If your commercial Christmas tree can do all of the above, it will be delivering the many benefits you envisioned when you invested in the tree. Over the years, it will pay dividends on your investment many, many times over. Our new animated RGB Majestic Mountain Pine is that tree. The real attention-grabbing magic of this tree lies in its RGB technology. Our tree features Minleon’s RGB 360 Module Light Strings. If you're not familiar with RGB technology, here's how it works: Each bulb contains a red, green, and blue LED - the basic building-block colors. Illuminating varied combos of those primary colors within a single bulb can create many different colors. So in effect, your RGB Christmas tree can morph into a completely different-looking tree at a whim. It's as if the tree becomes an animated, living thing, delighting spectators (prospective customers!) with an endless array of unique color displays. Before RGB technology came along, commercial Christmas trees would sometimes be strung with 3 or 4 different light sets. Switching from one light set to another could give the tree a new look to help hold peoples' attention. But our RGB Majestic Mountain Pine offers dozens of different color combos, patterns and designs from a single light set. And the animation controllers that come with the tree make it easy to choose and program the display sequences you want. Our animated RGB Majestic Mountain Pine is the most advanced commercial Christmas tree on the market. And yet it may be the easiest tree to install. That's because the tree was designed from the beginning for simplified installation. We make it simple to take full advantage of the tree's capabilities by eliminating the need for programming or complex wiring. All electrical cords, animation controllers, and power supply boxes are included with the tree. And our easy-to-follow instructions make set-up a breeze. The tree is fully UL/CSA rated for indoor/outdoor use, and is available in heights ranging from 12' to 50'. Unlike the Christmas tree you'll have in your home this year, your commercial Christmas tree is all about drawing attention and customers to your business. Or if you're purchasing the tree for your municipality, its job is to attract visitors to your city while delighting them and subtly encouraging them to linger a while longer. That's why you invest money in a commercial Christmas tree. And that's why the tree you purchase should be purpose-designed to fulfill that role. 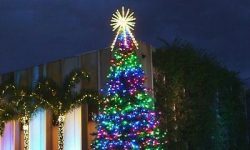 Christmas Designer's animated RGB Majestic Mountain Pine represents a new generation of commercial Christmas trees. It's a tree that's specifically designed to deliver the benefits you're seeking from a commercial Christmas tree. The tree's RGB technology offers more 'WOW' factor than any other Christmas tree. And that makes the RGB Majestic Mountain Pine the most mission-capable commercial Christmas tree on the market.